In honour of the recent 50th birthday of The Doctor, last weekend I decided to take the plunge and finally start reading my first ever Doctor Who book. I'm not generally a book snob, I've read pretty much any style of writing I can get my hands on, but - despite a childhood love of the television programme - Doctor Who is a, er, genre(?) I'd not previously considered reading. Whether that's because I've never forgiven the (I think) seventh Doctor for the nightmares that once kept me up half the night (something to do with zombies and a church, I probably didn't hide behind the sofa enough during that episode) I couldn't say, but if I hadn't found Who One in Ryde on the Isle of Wight I'm not sure I'd ever have gone down this line of reading. 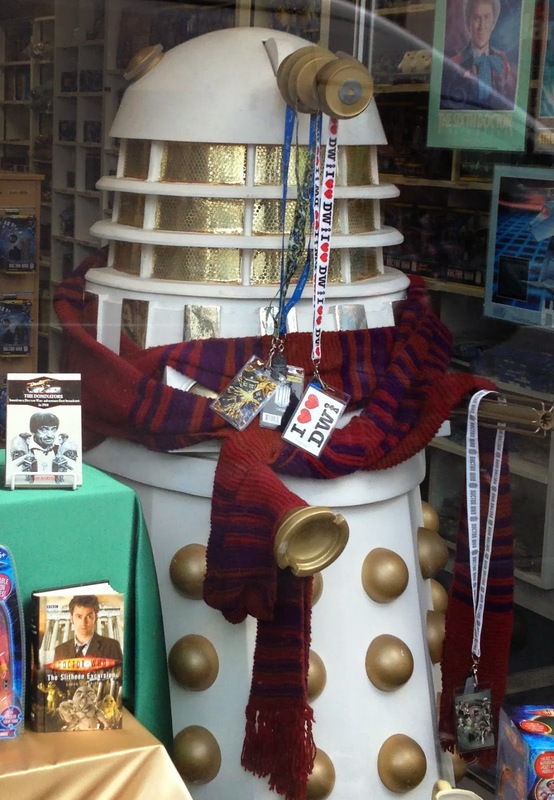 And so, stood outside the shop, eyeing up a suitably scarf-wearing Dalek, I realised this was possibly the first bookshop I'd ever entered with a feeling of total ignorance. Mostly because I was unsure if it would class as a bookshop in my mind when weighing up the balance of other Doctor Who items on sale (there was a lot of merchandise for fans), but also wondering if I'd even find something I wanted to buy - two quite important factors when deciding whether or not to feature the shop here. For the first concern my question was answered pretty quickly as a large wall of books greeted me, looking rather fine in all their modern artwork but with some original books thrown in too. For the second I did what I'd do in any good bookshop: I asked for help. Contrary to the popular stereotyping of Doctor Who geeks, the only man around was behind the counter, was perfectly capable of talking to the various women in the shop, and wasn't wearing a Tardis. In fact, he was just as friendly and approachable as any bookseller with a passion for their subject and didn't bat an eyelid when I asked him what I should buy. Just inside the door was a bookshelf of secondhand books (most of which had been so well looked after they could easily have been returned to the new bookshelves), and so as a newcomer to the genre I'd managed to narrow down my choices to this smaller, cheaper, selection, but beyond that I had no idea where to start. The bookseller asked me a little about what I might be interested in, and we managed to narrow it down to me not wanting to read about the Cybermen and generally being a bit of a wuss. After some more questioning he reduced the search to Doctors from the 1980s and soon began picking out a selection for me to choose from, recommending a variety of storylines or authors and telling me a little about each one. I was both grateful for his time and impressed by his knowledge. Eventually - after what must've been a lot of patience on his part - I chose Palace of the Red Sun by Christopher Bulis. An adventure featuring the Sixth Doctor and Peri (neither of which I could remember at the time of purchase), its cover blurb boasted an unscrupulous reporter, fanatical gardeners and the threat of an interstellar tyrant, what more could a reader ask for? And so to the book. I'm only halfway through at time of writing, but I can't put it down. It's well written and the story is captivating, but the thing that gets me the most is that - once again - I'm encountering books that are judged very much by their cover, or television series, or geeky stereotyping. I hadn't really had any particular expectation about the genre (I can't think of a more appropriate way to describe it) but if anything I'd possibly anticipated a cross between science fiction and crime and thriller. So when among the robots and spaceship-wielding bad guy I encountered a girl having to choose a husband and some kind of sprite that looked like a teddy bear I was surprised to realise how balanced the book is between the stereotypically male and female themes of action and fluffy stuff. In short, it's the kind of book I'd happily recommend to just about anyone I know, certain they'd each find something - probably very different - to enjoy. PS For reference, I have no idea if it's a controversial thing to admit but my favourite Doctor from memory is Peter Davison (I was only four when the fifth Doctor stepped down), and my favourite companion was Ace (who travelled with Doctor number seven). My favourite storyline, after some research, was Paradise Towers. If we jump to modern day then it has to be Christopher Eccleston and Matt Smith's current companion, Clara Oswald. Continuing on my Books are my Bag bookshop crawl, we come to Watermark Books in Kings Cross Station. A destination I very nearly skipped. While I'm all for bookshops in train stations - they've saved many a journey for me - I'd debated whether or not to visit due to time constraints and the concern that such a destination might be more functional than exciting. How glad I am I ignored this thought. I arrived at Kings Cross Station ignorant of my destination, and walked the concourse a little lost, wondering if I'd perhaps got the wrong train station. Then, just as I was about to give up, I spotted a crowd of people at the other end of the station and decided to be nosy. Which is when I discovered platform nine and three quarters and the crowd of Harry Potter fans hiding Watermark Books from view. Not a fan of the films I didn't stop to pose for a photo, but as the bookshop is nestled between the platform and a Harry Potter store the whole area is definitely worth a visit by enthusiasts of J K Rowling's books. But for me the magic was in the bookshop itself, because once again I had stepped through the door into a different world. Sure, it has all the characteristics of a regular bookshop: there's a featured table in the entrance, and further in there were travel guides that could be useful if you're off on a long journey, but even the recommendations shied away from the obvious, as themed collections added weight to the must-stock bestsellers. It wasn't long before I was hooked. Despite being a relatively small bookshop there was lots to take in (including that Harry Potter section), but personally I was torn between the children's section and a recommendations table at the back, which must surely have been designed for the well-travelled reader as a selection of translated books leapt into my hands. Yes, I was there to buy books, but how could I not stop and play with such a colourful character? I even returned to the bookshop the following week to pick up an Elmer for myself. Harry Potter may be the obvious celebrity draw to this bookshop, but Elmer will always be my hero. Some people remember birthdays, others faces or cars or clothes, I remember books. Tell me when your birthday is and unless it’s around an already significant date I’ll have forgotten it before the conversation is over, but tell me about a book you’d like to read and five years later, when I stumble across it in the forgotten corner of a bookshop, a lightbulb will go on in my brain and I’ll pick it up for you. Which is exactly what happened when I visited my sister’s local in Chiswick, but first I need to tell you about the bookshop itself. Stephen Foster Books is on Chiswick High Road, less than a five minute walk from Turnham Green tube. Apparently the oldest shop in the area, having opened in the 18th century, its traditional front stood out among the trendy offerings of the upmarket village, even without the tables of books that were revealed once it finally stopped raining. The prevalence of hardback spines and original dust jackets mean that on first inspection the shop probably doesn’t look much different to the early days of its life, making it both fascinating but not immediately accessible to the modern shopper. However, once I took the time to really look at the books on display I soon relaxed into my surroundings. This was probably helped somewhat by my sighting of a collection I’ve long dreamed of finding – the complete, original, 12 volumes of Arthur Ransome’s Swallows and Amazons. Unfortunately its (accurate) £180 price tag put it a little out of my price range, but I did pause for some time wondering if I could live off bread and water to justify its purchase. Eventually allowing reality to take hold, I pulled myself away and began to look for a book I could afford. Pausing at the children’s section I was sorely tempted by some of the original Peter Rabbit books, but also aware that such gems should go to a home where they’ll be properly appreciated for their historical as well as entertainment value I moved on. And so I found myself browsing the fiction – where I was pleased to note Iain M Banks sits on the same wall as Dickens. Leaning more to antiquarian stock than regular secondhand, I confess I did find myself beginning to wonder if I could justify the purchase of any of the beautiful books that had caught my eye. And so I ended up randomly stood in front of the cookery section, attempting to work through my budget for the month. Which is when something quite remarkable caught my eye. Years ago a conversation with my sister’s better half (he’s the main reader in the couple) had strayed to the subject of secondhand books and those odd titles every reader keeps an eye out for when first encountering a new bookshop. A particular request of his had been crime and thriller writer Len Deighton’s cookbook. Obviously. So imagine my surprise when I looked up to see Len Deighton’s Action Cook Book directly in front of me on the shelf, in a bookshop less than ten minutes’ walk from their home. Cue lots of frantic text messaging with my sister to check he’d not already found it, and even more surprise for me as I soon spotted a couple of the author’s French cookbooks too. My rule when bookshopping is to buy one book per shop, but I was so taken by Stephen Foster Books that I found myself reluctant to leave without something for myself. So I returned to the tables in front of the shop and picked up a Beatrix Potter, a more ordinary copy than the ones I'd seen inside. At the till I did my usual thing of chatting with the bookseller, but this time it was he who sparked the conversation, inspired by my purchase - talking about Len Deighton and his love of cooking (I now have to see The Ipcress File and pay particular attention to a scene where eggs are cooked). A few hours later I proudly presented the cookbook to its happy new owner with instructions he pay more attention to his local bookshop - I wonder if those French cookbooks have moved in yet?